After every rock climb or an adventure down south, we often stop at the lively J.Viterbo’s Barbecue for a filling dinner before going home. Despite the extremely simple nature of the place, we are not ashamed to say that we are irrevocably, hopelessly addicted to their barbecue just like the hundreds of students, policemen, employees, and other common mortals who live here. 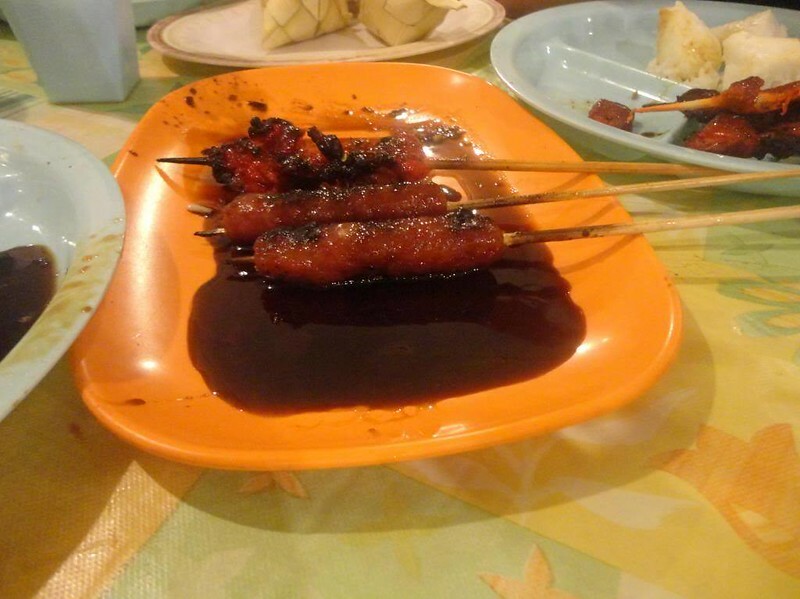 To say that their barbecue is the best in Cebu is an understatement. 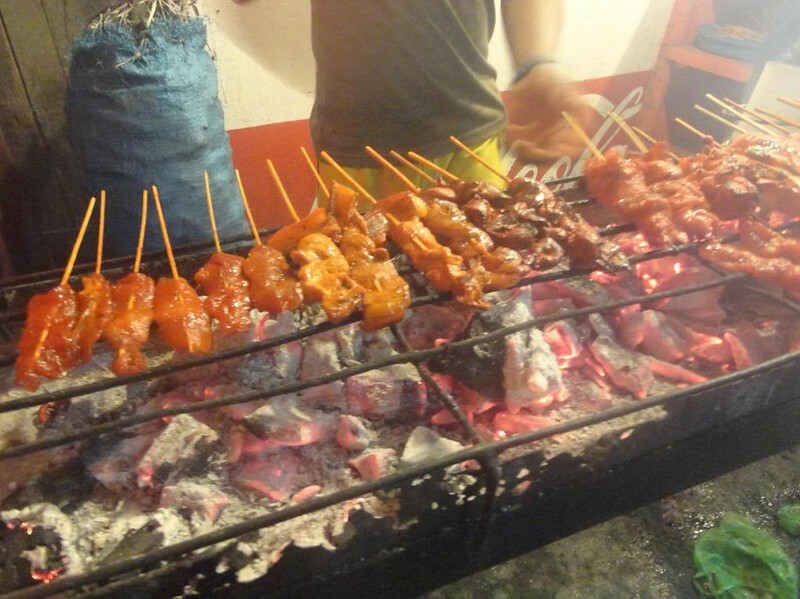 Cebu is one of the world’s barbecue capitals. Now, this is not just for charms. 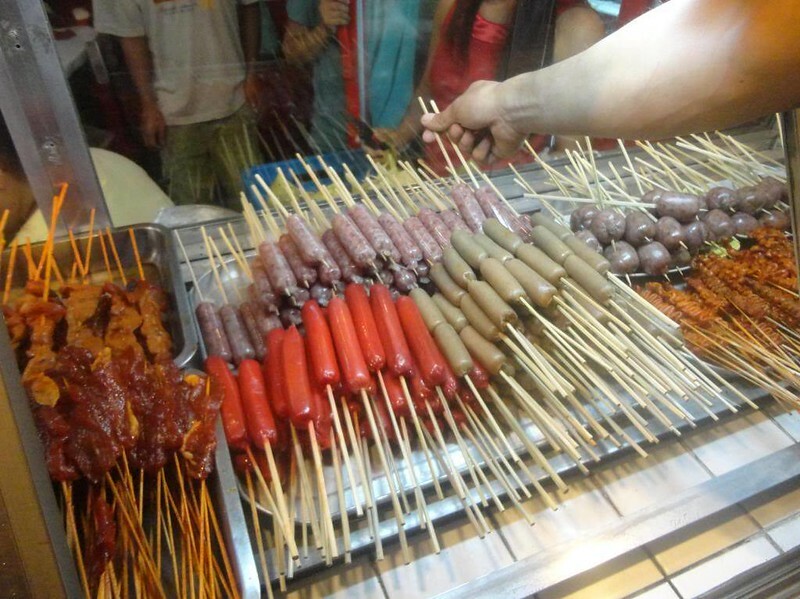 In 2010, Cebu City made an attempt to break the Guinness world record for the longest barbecue. 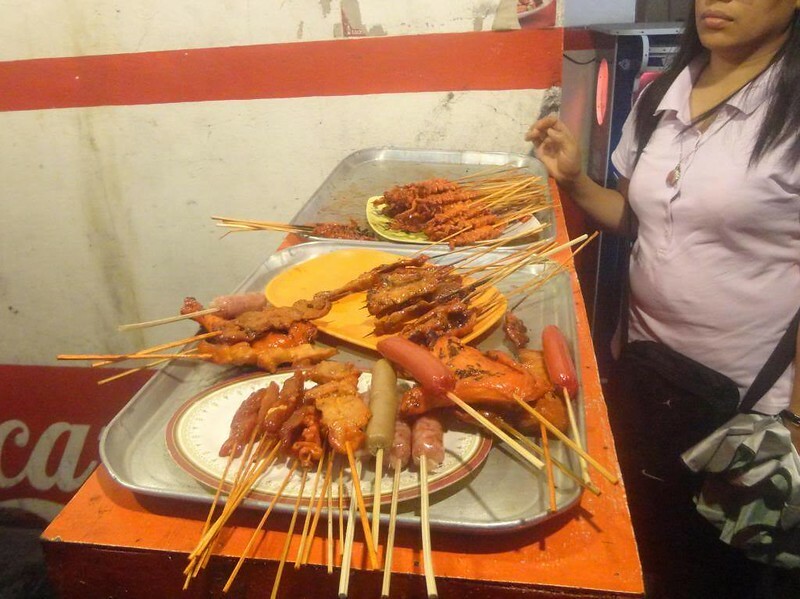 A mile-long grill was set up, and customers from all over the city wrestled each other for a few sticks of skewered pork, chicken, fish, sausages, and hot dogs. 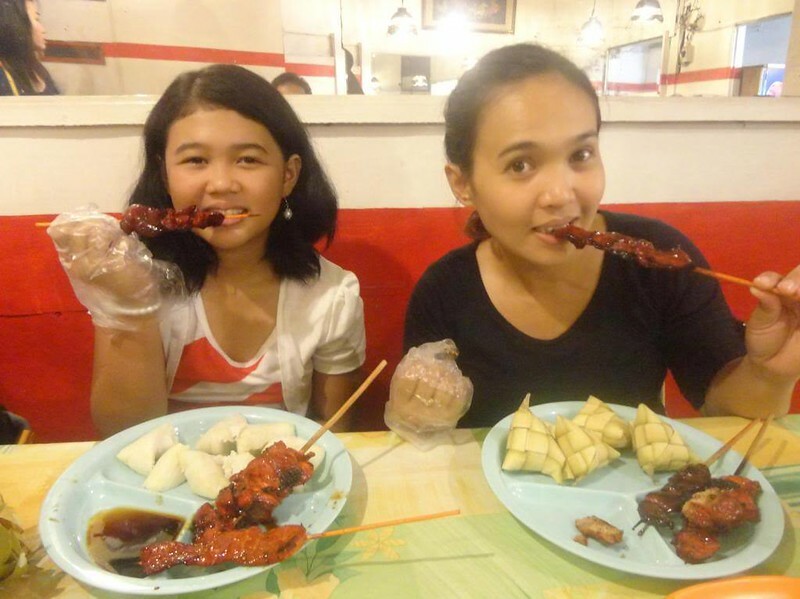 For the uninitiated (particularly foreigner backpackers visiting Cebu for the first time), Cebu has a barbecue “custom,” and this article shall show you how barbecue is eaten in the Philippines. For the locals and backpackers who wish not to blow a hole in their wallets, add this cool and cheap food establishment in your cadre. When you arrive at the Cebu South Bus Terminal after a hard day of adventuring in Cebu’s southern sector, walk across the highway towards the Caltex gasoline station and 7/11 convenience store. Cross the road, and you will find this busy barbecue establishment. Just like any Cebuano barbecue stall, approach the front of the store. 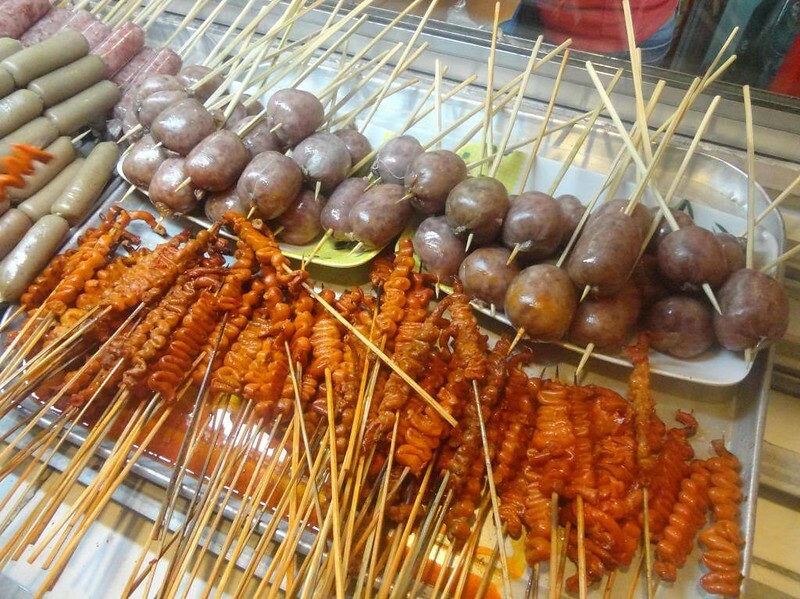 You will probably see rows and rows of skewered food products. Pick what you want. You’re assured that J.Viterbo’s Barbecue is clean because the food products are protected by a glass and screen counter, which keeps flies away. There’s a whole lot of chicken and liver. Chicken thighs are the most expensive parts, but that’s just 30 pesos. 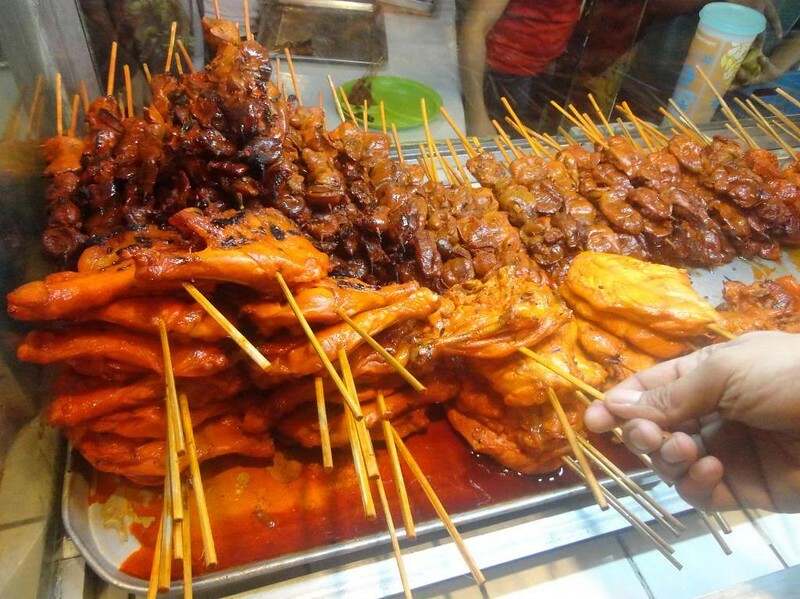 There are skewered pieces of liver and gizzard at the back. Chicken barbecue (and any chicken part, actually) are pre-cooked and swimming in savory marinade. Sausages abound! 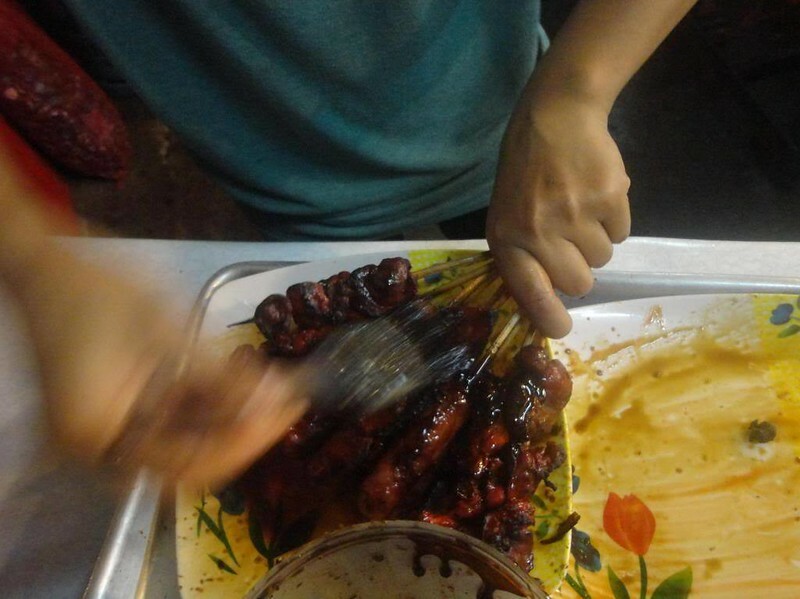 Hot dogs, chorizos, longganisas….you name it! 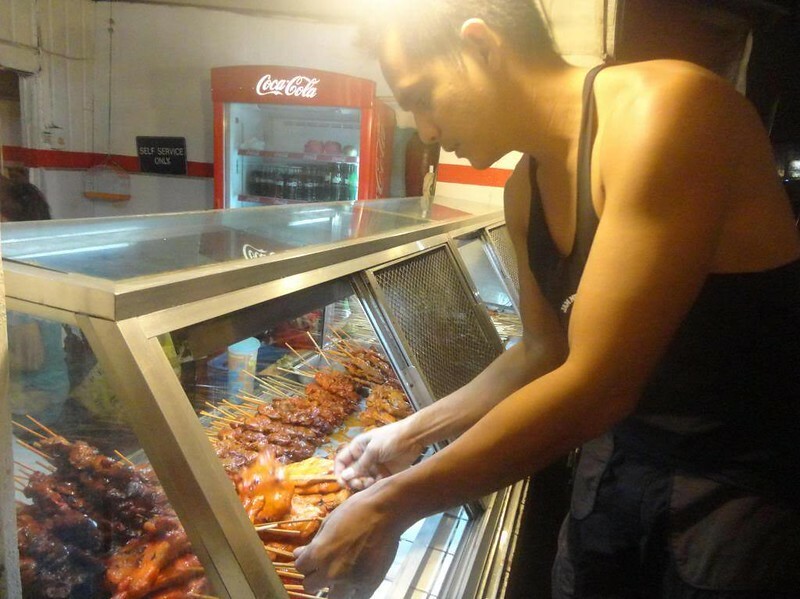 The far side of the glass counter is the home of barbecued chicken intestines. Yes, for the uninitiated, they sound gross. But in actuality, they taste pretty good. Okay, we’re done with our selections. Hmm…that’s a whole lot of barbecues. 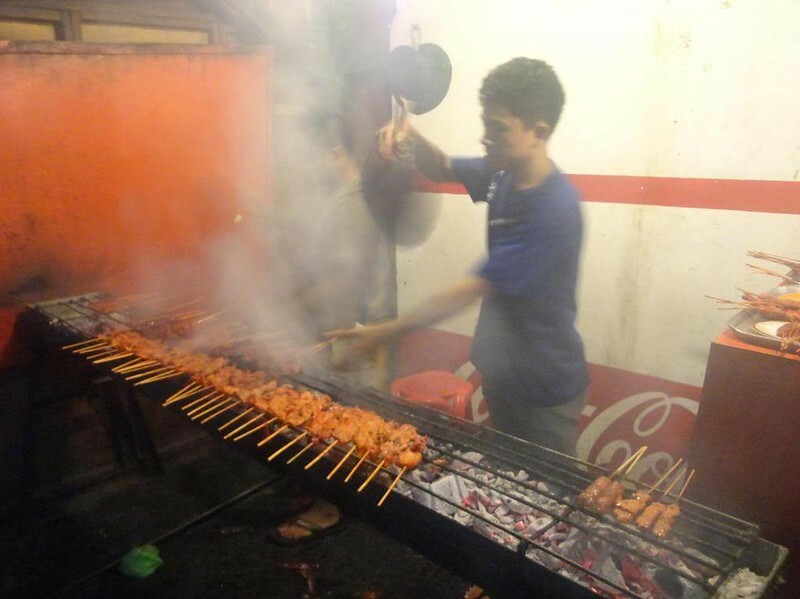 Then you take your selections to the grill where a guy furiously fans the red hot coals. He will cook several orders at a time. We think he has an eidetic memory because he can remember which order is for whom. And each order consists of dozens of sticks. Don’t worry if you find it difficult to hold your orders. The guy may hand you a plate where you could put your barbecue. Here are a couple of orders awaiting their turn to be placed on the grill. P.S. Who ordered that full plate of chicken intestines? 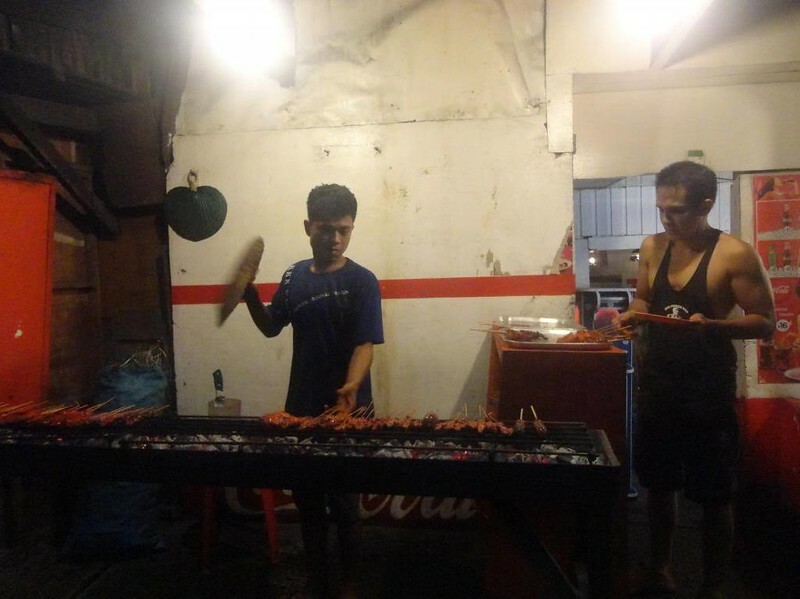 Our humble but expert barbecue cooks turn those hunks of meat into Cebuano culinary delights. During busy times, this grille may accommodate 3 cooks. Red hot coals provide convection to evenly cook the meat. The cooks baste the barbecue with top secret sauces to bring out the best flavor. You can wait outside for your barbecues to cook. 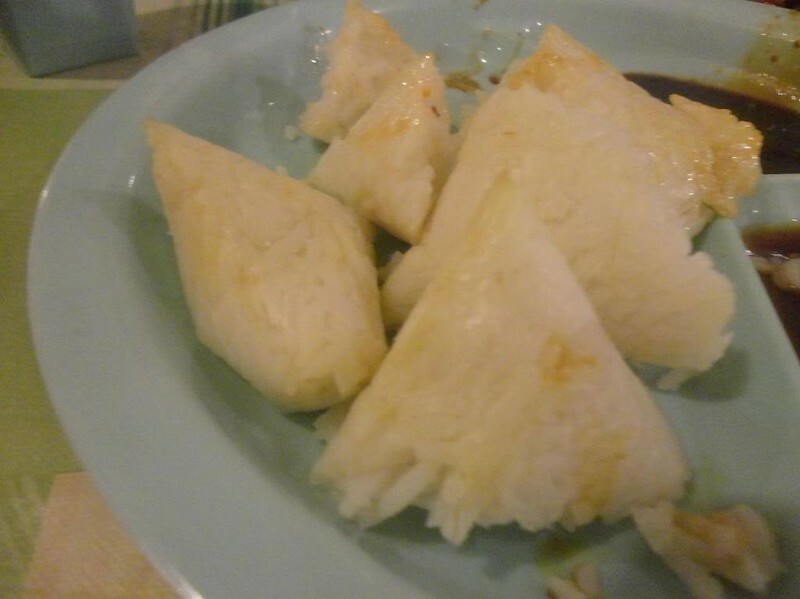 Once they’re done, one of the cooks will hand it to you. 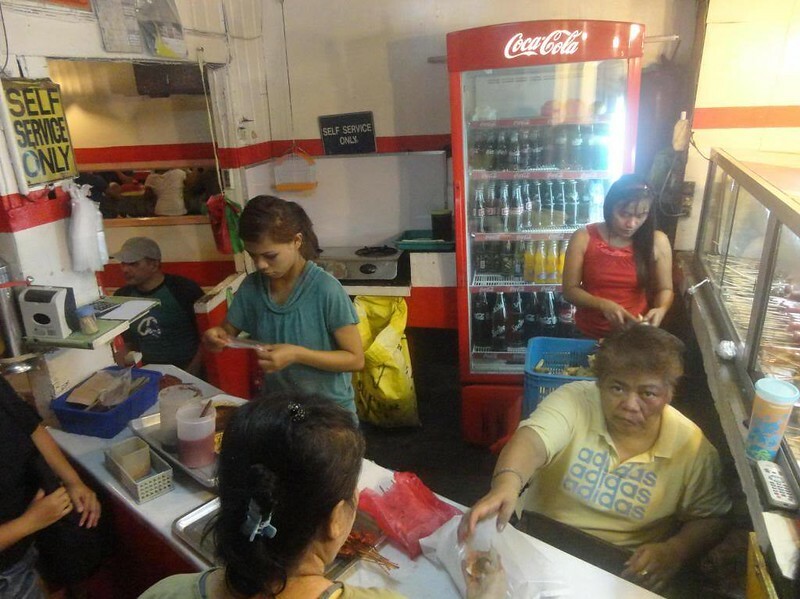 Bring your order to this counter where these ladies sum up your order. 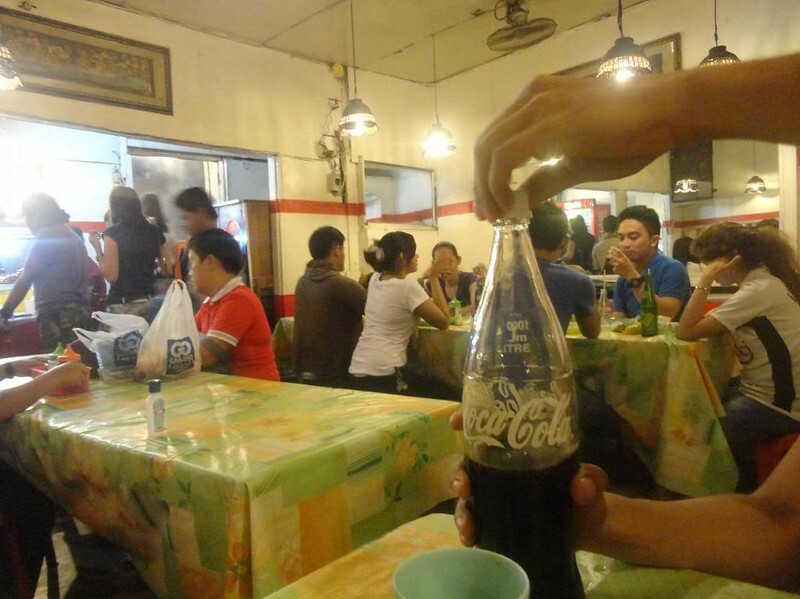 You can also order your puso (hanging rice) and softdrinks here. Unlike other expensive restaurants where you pay after you’ve eaten your meal, here, you pay before taking your meal. Looks like the owners are not taking any chances. This is the last stage of your barbecue’s preparation for consumption. The lady coats each piece with this special, top-secret sauce. We strongly believe that this is the sauce that makes the barbecue in this place stand out from the rest. We’ll tell you about that in a little while. Are your hands dirty? 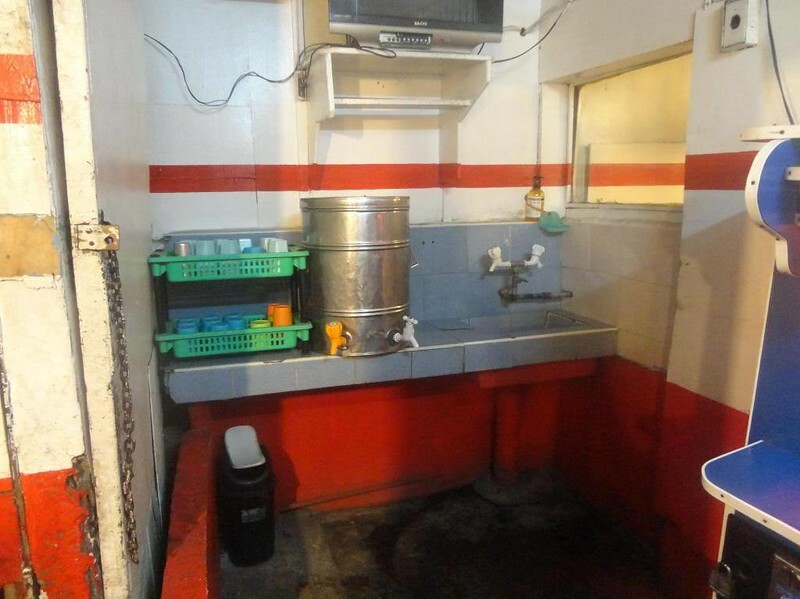 You may want to wash up here. The soap they provide is in the form of a strong detergent bar, which cuts through oil better than ordinary bath soaps or you may opt to use their liquid hand soap. Alternatively, you can ask the ladies for a plastic bag which you can wear like a glove to protect your hands from the grease and sauce. You may want to withdraw from the ATM . 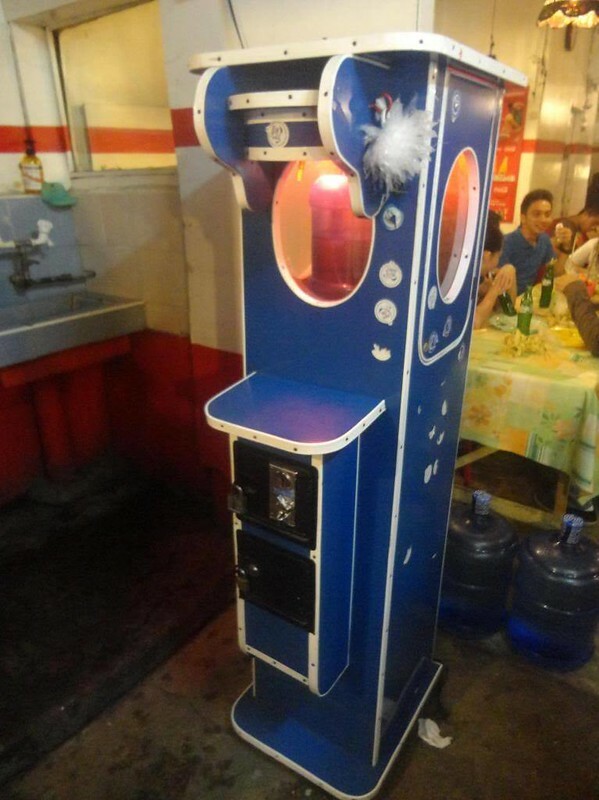 . . Automatic Tubig Machine. For those who don’t know, an ATM is simply a coin-operated dispenser. Slip a peso in, put a glass under the nozzle, and watch the water flow. Okay, barbecues? Check! Beverages? Check! Check! Clean hands? Check! Hungry? Oh, yes! Now it’s time to go to the spacious dining area behind the counter. 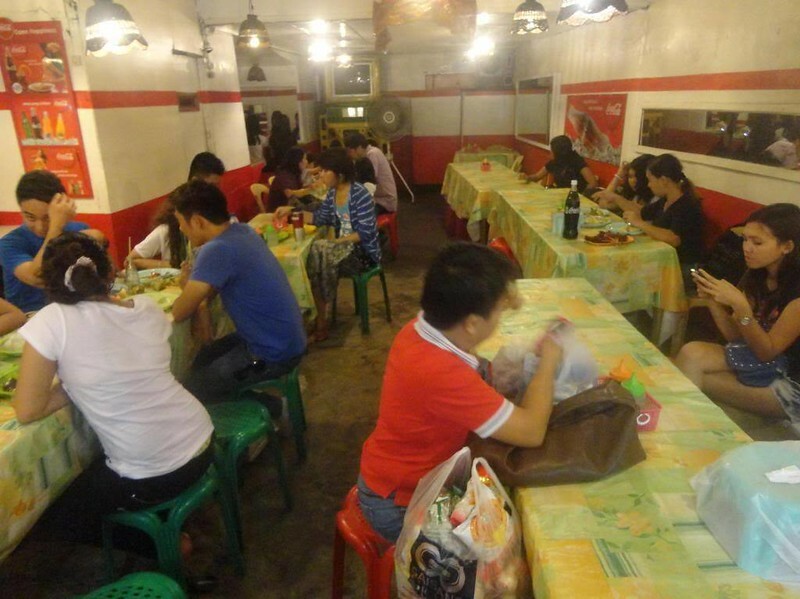 This setup is better suited for dining than in most other low-cost barbecue establishments because it “conceals” diners from view and it is far from the street where dust, dirt, and germs abound. Other barbecue stations place their dining setup in front of the store where you are at the mercy of grill smoke, vehicle emissions, dust, and dirt. And how do you feel if you’re enjoying your meal when some ragged-looking kid suddenly appears in front of you to ask for alms? Or someone suddenly serenading you? Or perhaps unruly, drunk youths who may crash onto your table without a moment’s notice? Or an out-of-control vehicle crashing directly towards you? That’s our order. Let’s see . . . there’s puso, sausages, pork, liver, and chicken backbone. Yummy! No barbecue meal is complete without an ice-cold Coke. Alexa and Sweetie began to enjoy the meal. 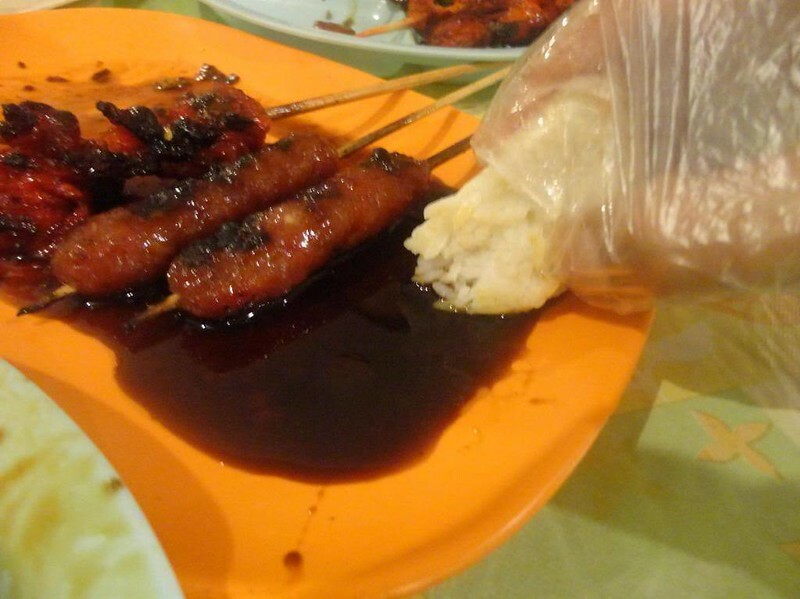 The barbecue here is so indescribably good that you can’t resist buying second batches of puso to go along with the meal. And another thing: the cooks seem to have perfected the art of barbecuing; there are very few burnt spots on the meat. Kudos! For the uninitiated, this is the interior of a puso. Now, saying that puso is simply rice wrapped in woven palm leaves is like saying baseball is a game which a ball is hit by a bat. Puso is definitely, uniquely Cebuano culinary art. We’ll find time to write an article about puso-making. In the meantime, know that puso has a distinctive taste in it considering that the rice has absorbed the pigment of the palm leaves. That’s the super-duper, mega-ultra, fantabulous, secret sauce that, we believe, should be among the world’s finest sauces. 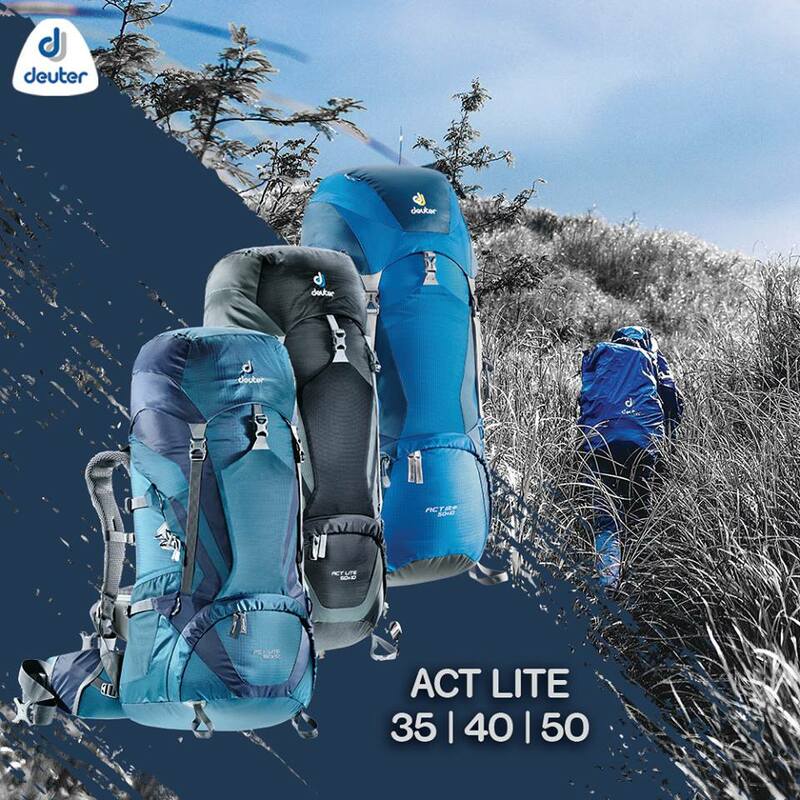 How do we describe it? Imagine a rich, thick savory sauce that is characterized with a tinge of sweetness and just the right heat from a few pieces of chili. It’s so good that we use it as a dipping sauce for the puso! Our verdict? 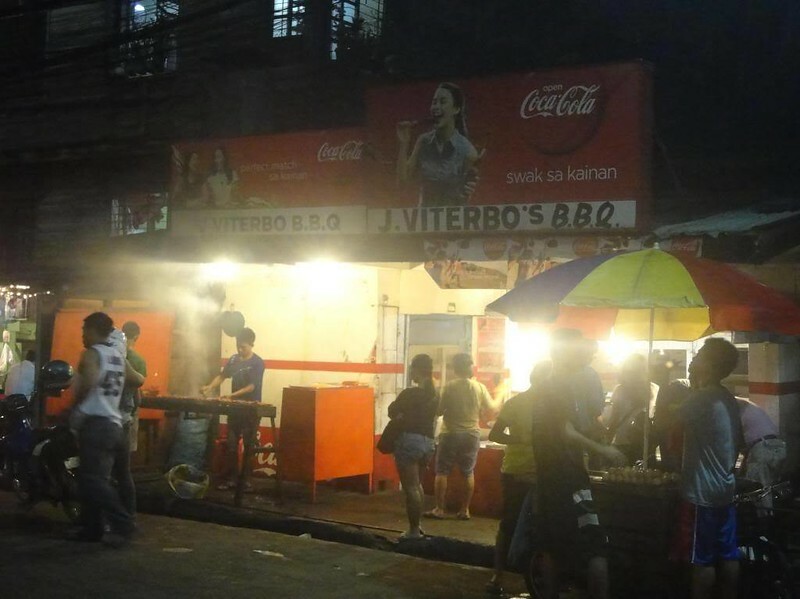 J.Viterbo’s Barbecue should be listed among Cebu’s top barbecue establishments. The food is absolutely heavenly. But it’s the establishment’s home-brewed sauce that is to die for. We swear, its tastiness is not of this world. Eating at J.Viterbo’s Barbecue is easy on the budget, which would be a delight for most cash-strapped adventurers, mountaineers, and backpackers. Don’t expect fine-dining service though; after you’re served, you’re on your own. Wow! Me and the Mister went there last Sunday by chance and we loooooved the BBQs! From Abellana, we were walking to Private to visit a cousin when we noticed this BBQ place. On the way back, we bought a couple more to bring to our housemates. You should also try the lechon manok on the next door. Hands down to one of the best lechon manok we’ve ever had. Nice! We especially love their sauce; in fact, we dip our puso rather than our barbecues in the sauce! Hehehe! They also own the junction beside them—the one selling fried pork, chicken, etc. A cholesterolic but delicious gastronomic frenzy! 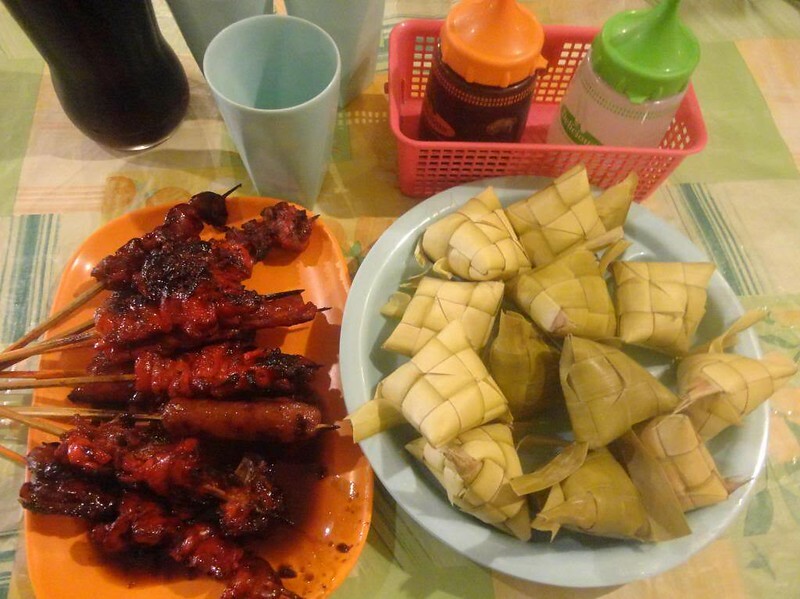 Yup, the lechon manok next door is also a dynamite. It’s very easy to locate J. Viterbo. It’s just across the Caltex gas station/7-11 which is across the Cebu South Bus Terminal. Don’t you just love their special spicy sauce? 🙂 Mmmmmm! Ooooh! !peanut sauce?!!!!weeee! Ok, thanks for letting me know. Do you know how to make their sauce dicer? If anyone knows how to don it pls share the recipe. We think they’re keeping their sauce recipe secret. It’s what makes them unique, after all. 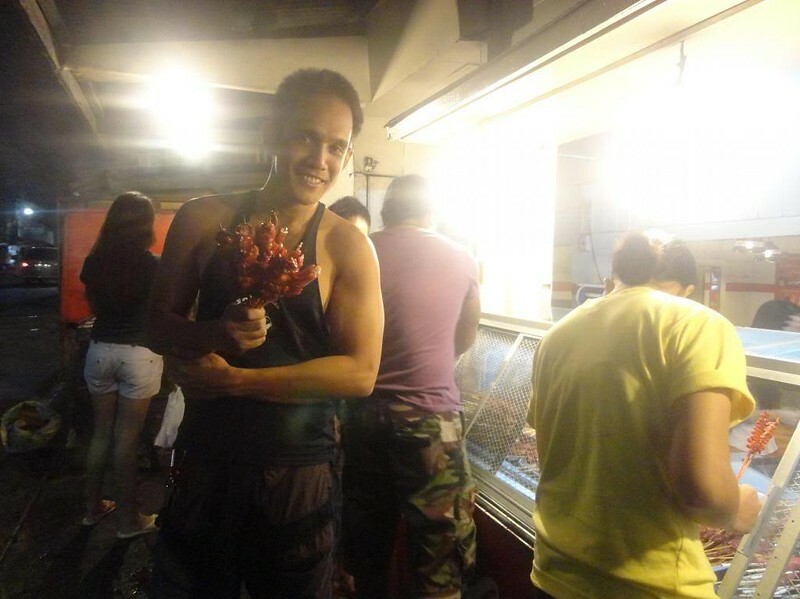 Missing Cebu now 😀 I remember when we were there, we ate at another food stall(s) called Larsian. I felt like a superstar there when horde of vendors started rushing to us offering their goods. Really nice experience in Cebu. Hehe! That’s nice, wanderlustwarjie. For us, J.Viterbo is better because of the total lack of vendors and mendicants rushing towards you. Meaning, you can eat in peace. Hehehe! And the food is great as you can read/see in the blog.